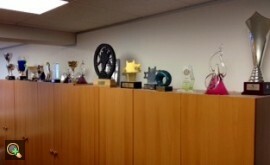 Our collection of trophies were unmoved! The office of the Choirs Aotearoa NZ Trust is located in Wellington’s CBD, in the thick of the worst affected area from the recent seismic activity. Luckily Central House in Brandon Street came through the earthquake relatively undamaged by comparison with some of its neighbours. In the Choirs office we had seven cracked windows, files dislodged and pictures sent askew. But our proud collection of trophies, won in competition overseas, remained completely unmoved – museum wax is great stuff! This latest shake has been a ‘wakeup call’ for Wellingtonians and many home emergency supplies have been refurbished as a result. It also served to remind us what our friends and colleagues in Christchurch have been through and still endure. Thanks to all who sent expressions of concern to us at Choirs Aotearoa.